Having an obsession with decorating means I sometimes need to find ways to cut costs and decorate on the cheap. Today I want to share with you some of my favorite thrifty decorating tips so you can do more in your home with a lot less money! You read that right! My favorite place to shop is in my own home. Walk around each room in your home and see if there is anything that might work in another room. 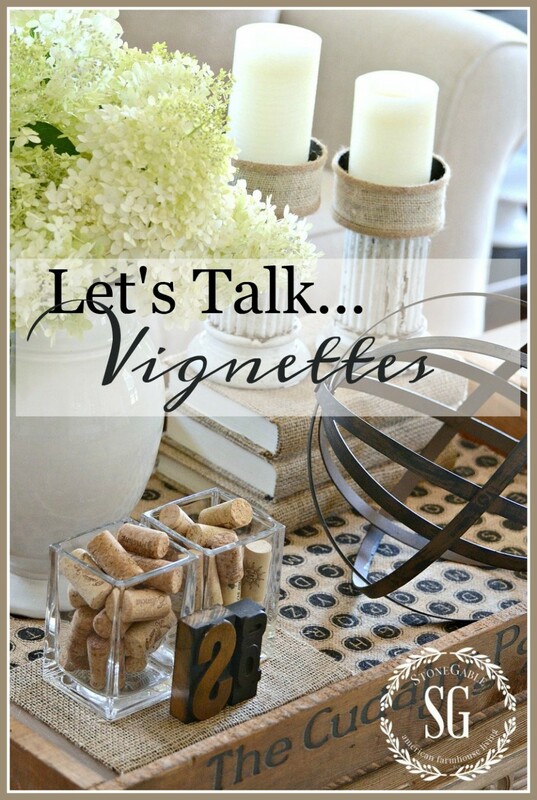 I do this all the time when it comes to vignettes. 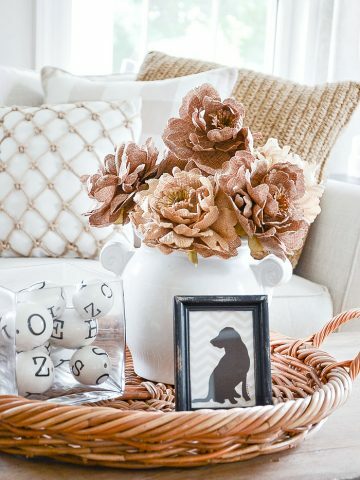 A vase from the dining room, a basket from the kitchen… you get the idea! The wine corks were leftovers from wine we have enjoyed so they were basically throwaway items I saved. And the pitcher that held my garden hydrangeas came from the kitchen! This chair originally was to do in an upstairs guest bedroom but it worked even better in our living room! I know this sounds daunting, but getting rid of piles of trash and clutter can really make such a difference when it comes to how a room looks and feels. Try it in one room this weekend and see what you think! My laundry room can get cluttered faster than I can clean it up. I call it a “hotspot”! If you have hotspots in your home declutter them and clean them and make sure you do not put anything in there that does not belong! You will feel so good if you can keep your hotspot room looking nice and tidy! You can see my decluttered laundry room HERE. Take a few minutes and go into the attic or your storage space. Are there old pieces of art or decor that might be beautiful in a room that you are re-decorating? Or the frame the art is in might look amazing by itself. 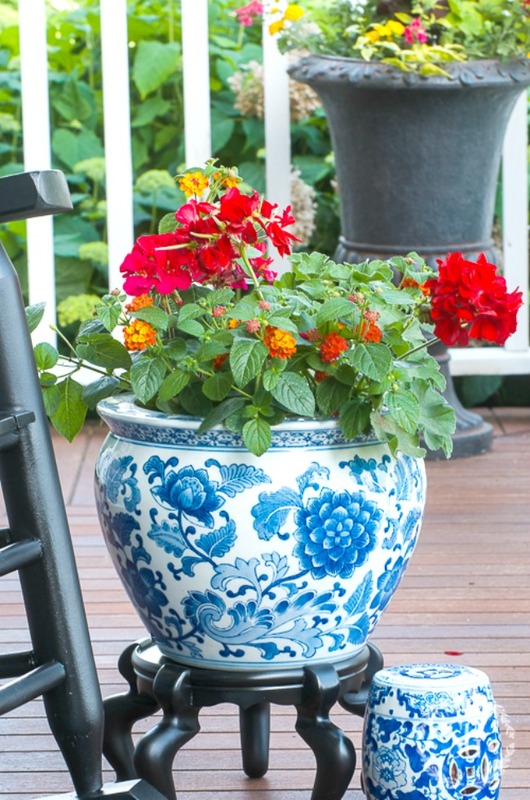 There might be things that you could breathe new life into with a little paint and TLC. The planter above once graced my living room and it’s twin my foyer. Because these were a little pricey I could not bring myself to get rid of them when my style changed. And I am so glad I found them in the basement and turned them into porch planters for the summer! Someone’s trash has been my treasure more times than I can count. Some of my very favorite home decor items have come to me second hand. I get such a rush when I find a great deal, too! I can’t tell you how many times I get asked about these topiaries. I found them at a thrift store for $10.00! I know!!!!! 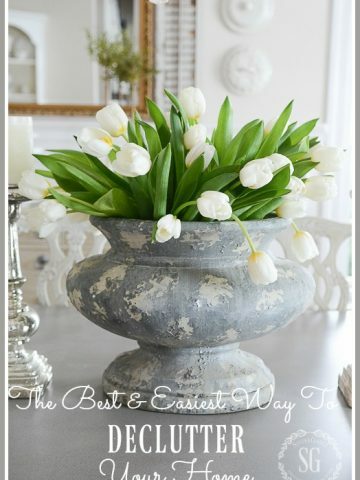 They have made an appearance in almost every room of my home and are one of my favorite decor items. 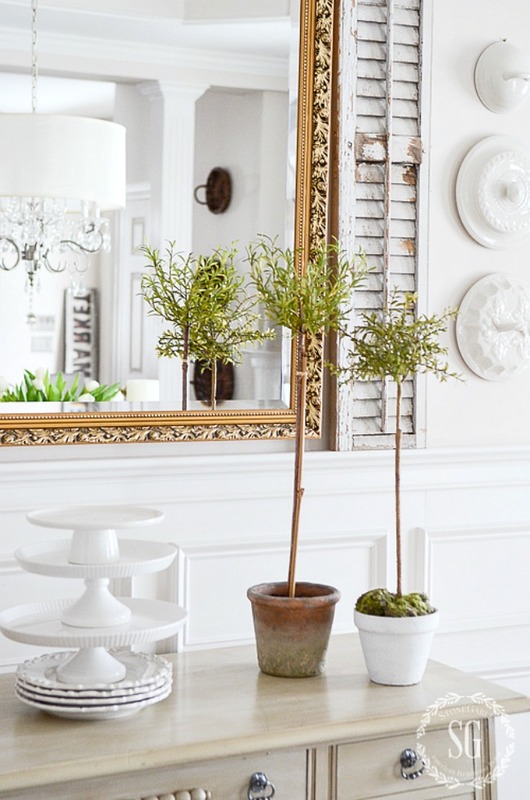 If you like them too I’ll have a DIY for a couple of topiaries I’m working on based on these. Look for the post in June/July. 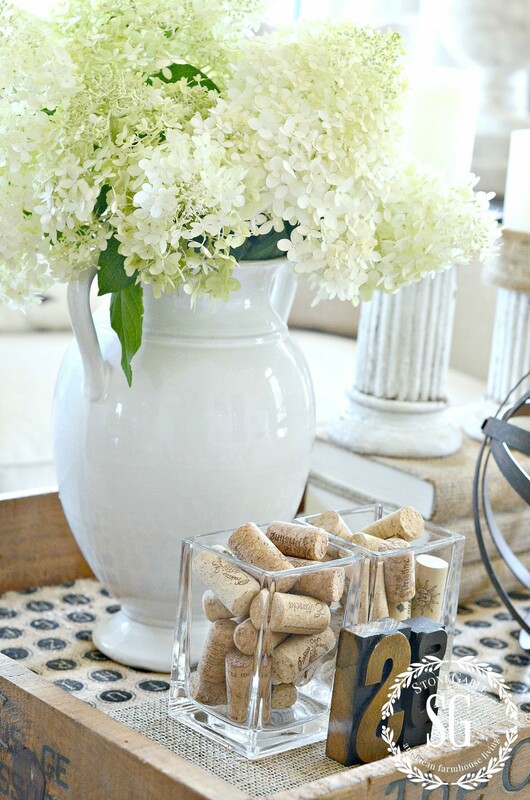 I love when I can use inexpensive items as a group or collection. Even everyday white plates look gorgeous when hung as a gallery on a wall. In the kitchen, I use cake plates, soup tureens, and my white dishes as display items. They work double duty as decor and useful kitchen items. A single thrift store chamber pot lid would not have the same impact as a trio of them hung by the large mirror in my dining room. My home is full of thrifty and even downright dirt cheap decor. 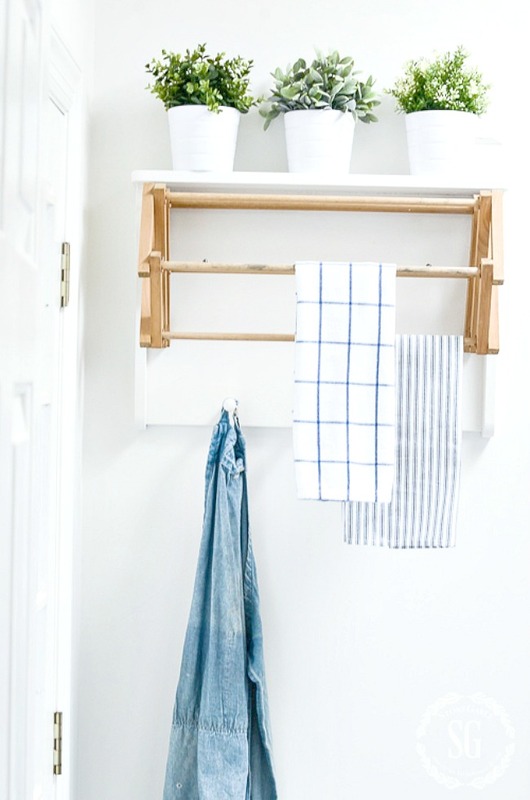 It’s the way we elevate those thrifty items to work with the rest of our rooms so no one is the wiser that makes the difference! Do you like to decorate on the cheap? Give us your best tips. We would love to hear!!!! I love the flowers in the pitcher. I have really been drawn to pretty but simple pitchers lately. It is so nice to change out the flowers for the seasons. Love the ideas! Yvonne, I’m a local Lancaster county girl too. In which thrift store did you find those beautiful topiaries? Love these tips. Your home is so calm and elegant. Don’t forget, when thrift shopping, a can of matte finish egg-shell white spray paint goes a long way in “refreshing” your finds and in tying several items together to form a collection or grouping! It’s my best friend! Cocktail Napkins! I have a grouping of neutral artwork on the landing of our front staircase heading up to my husband’s office. One small, thickly framed piece gets changed seasonally via pretty cocktail napkins cut to fit (I’ve also used Christmas cards) … a red Christmas ball, a blue bird, floral display, pots of fall sedum … and I keep them all in the frame to swap out easily for that little touch of the season! I am new to your blog. I love your content & decor! !I enjoyed this post! So much inspiration. I love white dishes of all sorts. I think they add such an elegant touch to the table. I do have a quick question. How did you hang the white dishes on the wall? I love that idea but wouldn’t know what to use to hang some of my dishes. Thank you for sharing your ideas! You have a fan in Hawaii! Oh this post has me longing for yard sale season! Until then I can hit the thrift shops at least. Beautiful inspiration as always! I’m looking forward to reading this soon! I am a decorating junkie and love doing small projects to spruce things up around the house.I always shop my home and have just given new life to several things with paint and spray paint, going neutral with black and white.I’m all about thrift shops and sales and using things in unexpected ways, love your topiaries too. I’m so glad to hear you thrift. I do it too and love the thrill of the hunt. The price tag sends me running to the car, yelling “ Start the Car!”. Lol I have a mix of expensive furniture with garage or thrift store finds. I’m saving money and saving the environment. I have friends that won’t step into a thrift store because of pride. Well, I take pride in a good buy. Love these ideas! I especially liked the Chamber Pot lids on your wall! Where did you find those items, and what do you do with the pot part?? Thanks! Spray paint! A chandellier that was an ugly gold tone was spray with textured black and has been in my dining room ever since. 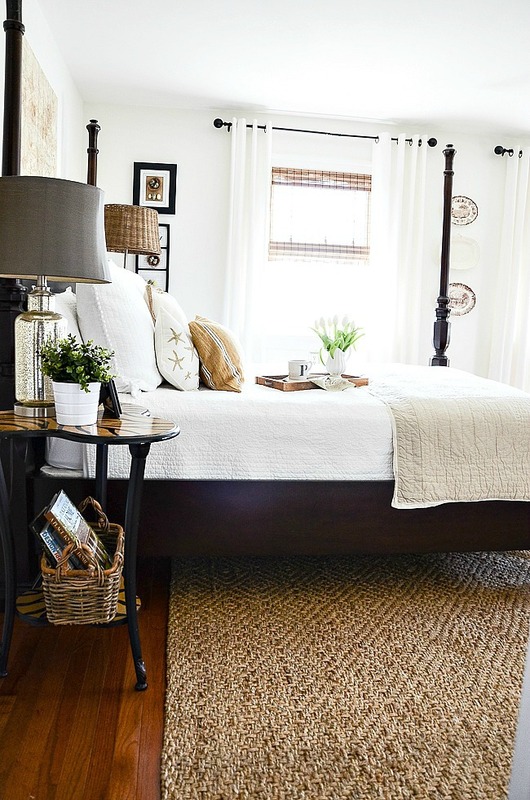 A ceramic table lamp was spray painted to complement a new color scheme in a guest bedroom. A random assortment of bunnies purchased at thrift stores and garage sales was unified when they were all sprayed wth a matte white. They come out in the spring time for a seasonal display. I have spray painted brass candle sticks. A brass candelabra was spray painted hot pink for a baby shower. The possibilites are endless. Cheap, quick, fun. 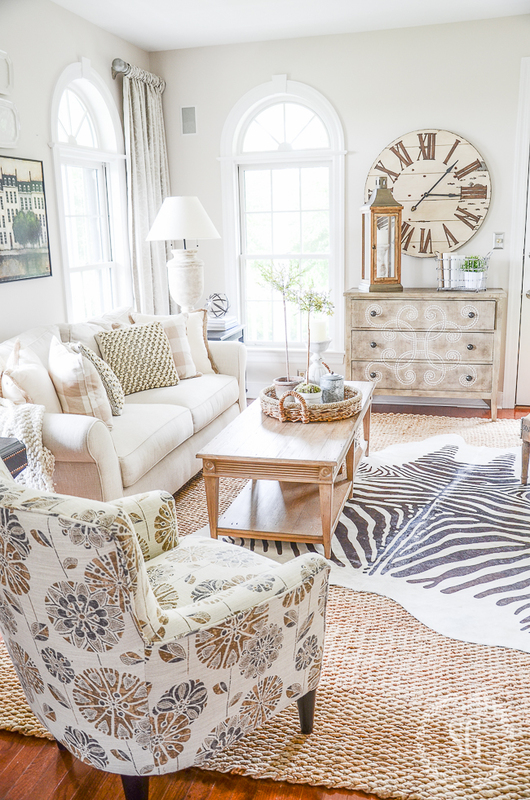 Yvonne: You may have mentioned in another post, but where did you get the sisal rug in your living room? Is it fairly soft underfoot? Does it shed? Thanks! I too, love to decorate with “finds”. Would you please share how you have hung the white stoneware lids? I also notice you often move your wall decor around. How do you manage with leaving holes in your walls? Thanks so much! Wishing you many blessings. Great tips today. I always scout my basement to see what I can repurpose. I also need to do the decluttering. I seem to want to hang on to stuffI don’t need. Love your site! 🙂 My favorite way to decorate is with things I find in my yard….or other yards! Acorns gathered in the Fall, branches with leaves turning, evergreens, etc. I love bringing nature in to my home. Also love the grocery store for cheap decor….gourds, squash, artichokes….display for awhile then cook them up! Best of both worlds! This doesn’t have anything to do with your post but…where did you find the oversized clock in your living room? I really like the bed room in the natural fall colors. It is like bringing the outside inside. so crisp and clean. You can almost smell fall in the air. Love these tips! Especially the one about decluttering. With a smaller house, I find that’s the most important thing to remember. Rather than bringing in more stuff, I often just need to remove some things! Estate Sales! Some of the items can be pricey, but if you focus on one or two items you would like to add to your collection, it can be a fun place to shop. Estatesales.net is a great way to keep up with the sales in your area. 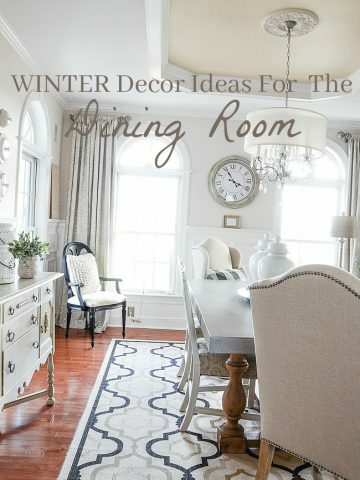 Great tips for Decorating On the Cheap!!! Thank you so much for sharing all of your wonderful decorating/decor tips – for free!!! I’ve learned so much. 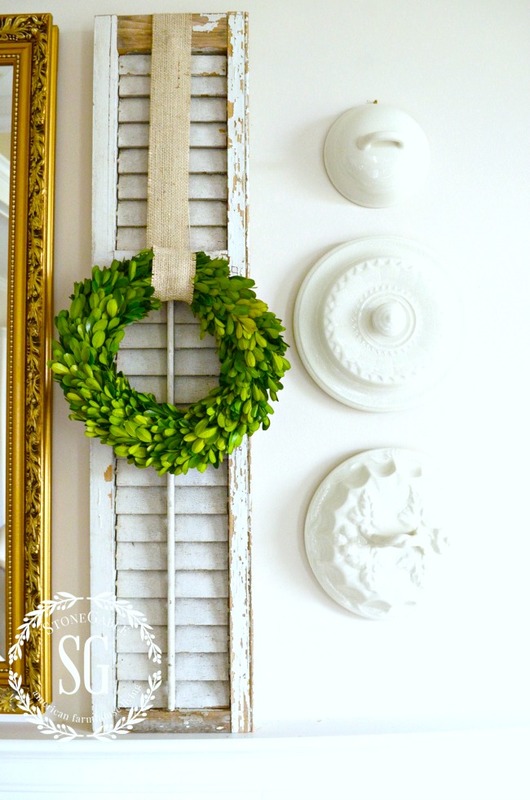 I love this post as I love decorating on the cheap too!! It’s always so much fun and helps me think out of the box. Sometimes it takes a little nudging from maybe reading your post or a picture in a magazine!! Thanks so much for sharing your ideas!! Have a great weekend!! Certainly like your advice on shopping our own homes. After years of decorating many different style homes I have accumulated quite a few collections and also focal point objects to add to my rooms. Still love to shop but it is such fun to use the things we have! I love this post….I head for the “Clearance” aisle before I look at anything else no matter what store I’m in. And shopping my house all the time is genius. So fun when Denny asks if something is new. As always, thanks for the great tips. Thanks for your tip Victoria!